After increasing for four consecutive months, real gross domestic product was down 0.3% in October. Widespread decreases in manufacturing output and lower oil and gas extraction were the major contributors to the decline. Goods-producing industries contracted 1.3% as manufacturing, mining, quarrying, and oil and gas extraction, construction, utilities and the agriculture and forestry sector all declined in October. Service-producing industries edged up 0.1%, mainly due to increases in real estate and rental and leasing as well as retail and wholesale trade. The public sector (education, health and public administration combined) also edged up. The finance and insurance, administrative services, accommodation and food services and transportation and warehousing services sectors declined. Manufacturing output contracted 2.0% in October, the largest monthly decline since December 2013. Both durable and non-durable manufacturing were down, reflecting a lower volume of exports of manufactured goods. Durable manufacturing was down 2.1%, the third decrease in four months. Almost all industrial groups were down, with the largest declines in terms of output registered in machinery, fabricated metal products and primary metal manufacturing. Non-durable manufacturing declined 2.0%. Petroleum and coal products manufacturing was down 6.5%, as production was affected by maintenance and turnaround work at some facilities. Food manufacturing declined following three months of growth. Textile, clothing and leather manufacturing as well as paper manufacturing increased, while chemical manufacturing edged up. The output of the mining, quarrying, and oil and gas extraction sector decreased 1.2% in October. Oil and gas extraction fell 2.5% in October, following four consecutive monthly increases. Both conventional oil and gas (-2.9%) and non-conventional oil extraction (-2.0%) were down. 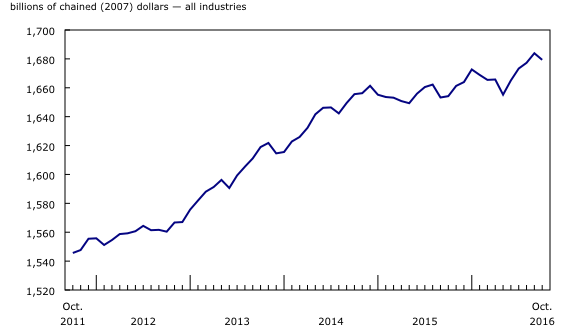 Support activities for mining and oil and gas extraction rose 4.4% in October on the strength of higher drilling activity. Despite a third consecutive monthly increase, output in the subsector remains well below its level at the beginning of 2015. Mining and quarrying grew 1.8%. Non-metallic mineral mining rose 8.6% as a result of higher production of diamonds and potash. Coal mining rose to supply export markets, while metal ore mining fell in October. Construction decreased 0.5% in October, the fifth decline in six months. Residential construction was the major contributor to the decrease, down 1.0% as there were fewer housing starts. Repair and non-residential construction also slowed, while engineering construction edged up. Real estate and rental and leasing rose 0.4% in October. Activities of real estate agents and brokers increased 3.6% in October, following five consecutive monthly declines. Retail trade rose 0.7% in October as most subsectors increased. The largest gains were in food and beverage, general merchandise (which includes department stores) and clothing and clothing accessories stores. Declines were posted at health and personal care stores, gasoline stations and electronics and appliance stores. Wholesale trade grew 0.6% in October, partially offsetting the 1.3% decline in September. Building materials and supplies, motor vehicles and parts and food, beverage and tobacco wholesaling were up. Farm products and personal and household goods dealers were down. Finance and insurance was down 0.5% in October, a third consecutive monthly decline. Banking, financial investment as well as insurance services were all down, mainly attributable to lower investment revenues and market volume. The public sector (education, health and public administration combined) edged up 0.1% in October. Health care and educational services increased while public administration edged down. Utilities were down 1.0% in October due to lower electric power generation, transmission and distribution and natural gas distribution. 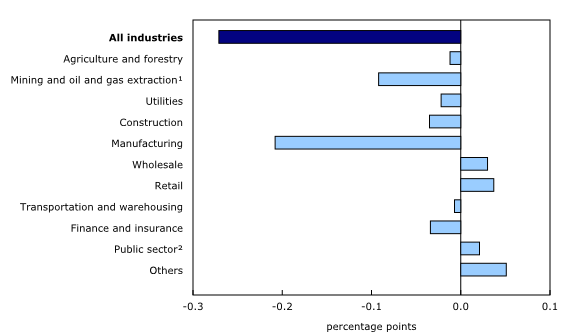 After a strong summer, sectors influenced by tourism were down in October. Accommodation and food services decreased 0.3%, as accommodation services fell. The output of the arts, entertainment and recreation sector was down 0.2% due to a decrease in amusement, gambling and recreation. 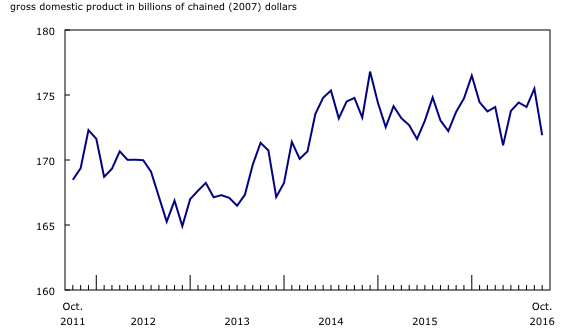 Transportation and warehousing services decreased 0.2% in October. The decline in oil and gas extraction led to lower output in pipeline transportation. Air and water transportation decreased for the first time since May 2016. Rail transportation was up due to higher exports of goods typically requiring delivery by rail (such as petroleum, coal and motor vehicles). Monthly gross domestic product (GDP) by industry data at basic prices are chained volume estimates with 2007 as the reference year. This means that data for each industry and each aggregate are obtained from a chained volume index, multiplied by the industry's value added in 2007. Monthly data are benchmarked to annually chained Fisher volume indexes of GDP obtained from the constant-price supply and use tables (SUT) up to the latest SUT year (2013). For the period starting with January 2014, data are derived by chaining a fixed-weight Laspeyres volume index to the prior period. The fixed weights are 2013 industry prices. With this release of monthly GDP by industry, revisions have been made back to January 2016. For more information about monthly national GDP by industry, see the System of Macroeconomic Accounts module on our website. Real-time CANSIM table 379-8031 will be updated on January 13, 2017. For more information, consult the document Real-time CANSIM tables. Data on GDP by industry for November 2016 will be released on January 31, 2017. To enquire about the concepts, methods or data quality of this release, contact Allan Tomas (613-790-6570), Industry Accounts Division.